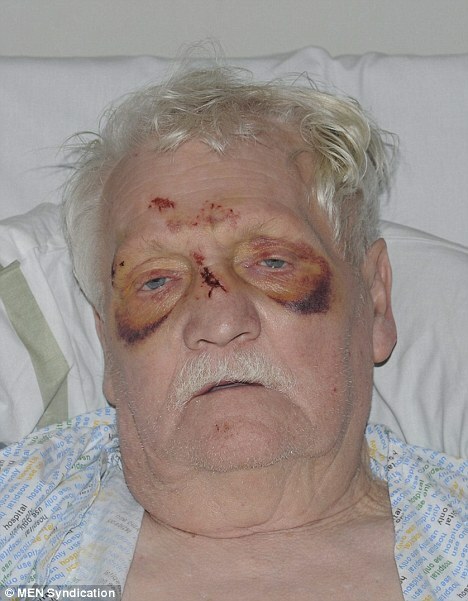 OLD WW II VET WEARING RAF JACKET BADLY BEATEN BY ‘ASIAN’ THUGS……. – The Tundra Tabloids……. OLD WW II VET WEARING RAF JACKET BADLY BEATEN BY ‘ASIAN’ THUGS……. The 69-year-old was punched and headbutted by two Asian or mixed-race attackers who spotted him in military uniform. Paramedics took the veteran to hospital after he was left with bruising, black eyes and an injured nose following the early evening attack. The youths, aged between 17 and 20, shouted offensive remarks about soldiers at the white-haired pensioner and then attacked him when he responded. The incident happened in Sherwood Street, Fallowfield, Manchester, police revealed today. Officers today released a shocking picture of the bruised victim in a hospital bed with two black eyes after the attack. Police Constable Michael Seddon, who is investigating the incident, said: ‘This was a mindless and brutal attack on a vulnerable member of the community. ‘The victim was left extremely shaken and he is still recovering from his injuries.’ One of the attackers was described as of stocky build, 5ft 6in tall, had thin braided hair and was wearing dark clothing. The second man was chubby, 5ft 4in tall, had short shaved black hair and was wearing dark clothing. The two men fled the scene on bicycles. The ex-serviceman, who was wearing a poppy, was attacked on November 1 but police have only just released information about the incident. Previous Post Previous Post FINNISH ARCHBISHOP BEWAILING INEQUALITY IN FINNISH SOCIETY……. IMHO this is some part of a ‘street Jihad’, these violent punks are roaming the streets looking for the old and weak to assault This is a direct result of radical Islamist supremacist teachings that the lowly Infidel must never be dealt with on an equal level. The Lapdogs and Lackeys of Islam in the MSM and the political class still insist that these are ‘unusual’, ‘random’, or ‘out of the ordinary’, in our usually peaceful towns and villages. Nothing could be farther from the truth, by some miracle if the true figures of these violent assaults were to be revealed even the most liberal person would be shocked. Heaven forbid that the ethnic background and ‘faith’ of the perpetrators be revealed, why the MSM and the government would be accused of racism and Islamaphobia. Now we know why the EDL exists ‘ How much crap is a nation supposed to take, while their elected representatives do nothing but sit on their hands and ask for calm and ‘understanding’. I find this most sickening. Excellent summary of the issues Frank! Note the six week delay between the attack and the release of the picture. Yes Tom, Political Correctness (i.e. Marxism) always precedes common sense and the dissemination of the truth. The liberal scoundrels always tailor and twist the facts to suit their political needs. Thank you Raymond. I’ve been outspoken all my life, and sometimes paid a price. I try to call it as I see it. And people in Uk are complaining about Polish.We white, we christian, we always fought for the right reasons, and we like british.Older generation remember WWII, rest is turning into pro-american idiots.Its a shame that good people always die first.